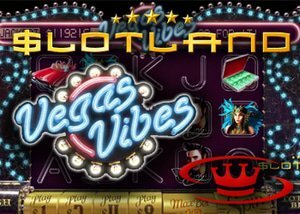 Many people go to Las Vegas each and every year for the entertainment, but the new Vegas Vibes slot by Slotland brings it straight to your computer or mobile device. Las Vegas is known for being sort of the center of the gambling universe. However, a lot of people forget that it's also a major entertainment-based city, and that's exactly what the new Vegas Vibe online slot focuses on. This new Slotland release offers five reels, three rows and 20 paylines of bright and vibrant Las Vegas entertainment. The graphics in this game are of a fairly high quality, and they use neon lights and bright visuals like what you would see at a Las Vegas show. Players get options for playing $1, $2, $4, $8 or $10 per spin. If you play with the maximum bet size of $10 per spin, then the top prize becomes a progressive jackpot that seems to stay around the mid- to upper-five figure range the majority of the time. There are 11 total symbols in this game. The lower end symbols are made up of the A, K, Q and J symbols like what you see in many online slots. You can also pick up martini glasses, briefcases full of money, classic red cars, a woman who appears to be Cher or a man who is very clearly Elvis. The casino chips are wild, and the dice symbols are scattered bonus symbols. Three or more of the dice symbol takes you to a free spins bonus feature. In this feature, all of your wins are hit with a 3x multiplier. On top of that, the wild symbols become expanding wilds during the free spins, and that means that they'll expand vertically to cover the entire reel. It's a pretty good recipe for some major, multi-line wins, and the expanding wild makes it much easier to hit the upper end of the payouts. Overall, this looks to be a very entertaining game with a lot of value in the bonus feature and chances to win a sizable sum of money with a progressive jackpot.